Yes, it's March 25, ever so many ages after the destruction of the Ring, but I still feel the need to celebrate the efforts of Tolkien's heroes, who endured so much and risked so much for the sake of their world. So far, this has been a dark, catastrophe-ridden year for much of the world. Some might wonder what is the point of celebrating the deeds of fictional people in fictional crises. But it is the way of great literature to offer an alternate, richer, more intense way to perceive and experience the real world, giving it back to readers freshly observed and appreciated. It is never a waste of time to lift up the good, even if they are fictional. The exemplary are exemplary whether they live in books or the news or the house next door. So let us praise the day and its heroes, and the man who told their story. Praise them with great praise! The illustration chosen for this entry is 'The Cracks of Doom' by American artist Tim Kirk. 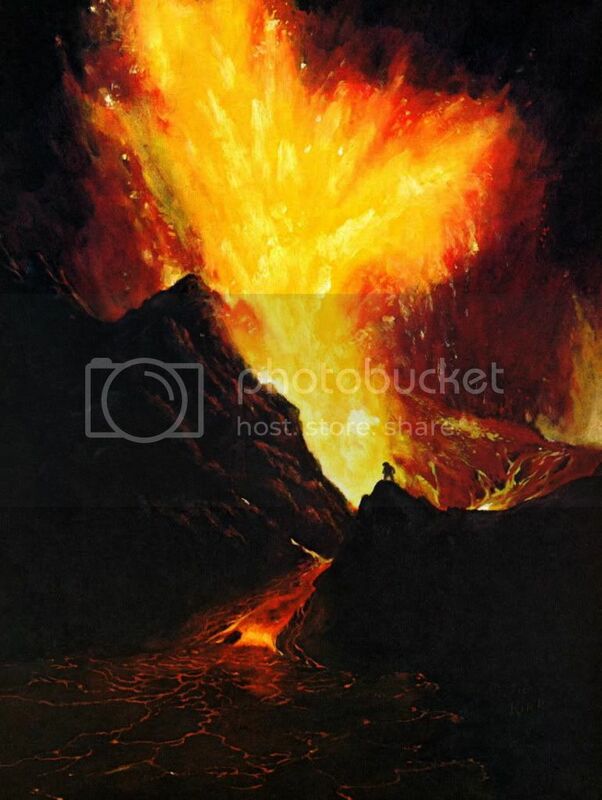 Kirk, an early fan-artist, painted a series of Tolkien illustrations for his master's thesis project at CSU-Long Beach, including 'The Cracks of Doom'. Ballantine published his illustrations in the 1975 Tolkien Calendar. Kirk now runs his own design firm in the L.A. area. It's the drama of the composition that attracted me, the extreme darks and brilliant fire colours, Frodo alone on the precipice, seen as a mere shape silhouetted in the fiery light. Still Frodo, and yet something simplified, stripped of detail. I thought it suited the mood of the poem well. The poem jan-u-wine wrote for this day, 'Naked in the Dark', is set near the end of the Quest, in the Sammath Naur. On the slopes of Mt. Doom, Frodo and Sam have just repulsed an ambush by Gollum. Frodo has commanded Gollum down, like a dog, then gone on ahead. Sam is left to deal with Gollum. Gollum might have died right there, Sam itching to run him through, but Gollum begs for mercy. "The pity of Bilbo" wells up in Sam, almost against his will, and he tells Gollum to "be off". Remembering Frodo, Sam turns to follow after, to find him. The poem, you will see, has already found him. The path climbed on. Soon it bent again and with a last eastward course passed in a cutting along the face of the cone and came to the dark door in the Mountain’s side, the door of the Sammath Naur. Far away now rising towards the South the sun, piercing the smokes and haze, burned ominous, a dull bleared disc of red; but all Mordor lay about the Mountain like a dead land, silent, shadow-folded, waiting for some dreadful stroke. Sam came to the gaping mouth and peered in. It was dark and hot, and a deep rumbling shook the air. ‘Frodo! Master!’ he called. There was no answer. For a moment he stood, his heart beating with wild fears, and then he plunged in. A shadow followed him. At first he could see nothing. In his great need he drew out once more the phial of Galadriel, but it was pale and cold in his trembling hand and threw no light into that stifling dark. He was come to the heart of the realm of Sauron and the forges of his ancient might, greatest in Middle-earth; all other powers were here subdued. Fearfully he took a few uncertain steps in the dark, and then all at once there came a flash of red that leaped upward, and smote the high black roof. Then Sam saw that he was in a long cave or tunnel that bored into the Mountain’s smoking cone. But only a short way ahead its floor and the walls on either side were cloven by a great fissure, out of which the red glare came, now leaping up, now dying down into darkness; and all the while far below there was a rumour and a trouble as of great engines throbbing and labouring. The light sprang up again, and there on the brink of the chasm, the very Crack of Doom, stood Frodo, black against the glare, tense, erect, but still as if he had been turned to stone. ~ March 25: "Eagles to Ithilien", with screencaps from the film scene. Ohhh, poor hobbits. Thank you for sharing this 'new year' remembrance with us. You're welcome, Shirebound. We have made it a three-parter this year, the 23rd for Gorgoroth, today for the Sammath Naur, tomorrow for the hobbits being rescued, although I won't post that today, the actual day, but tomorrow. Thanks for joining us. Praise them! I read the opening of this and so appreciated how while it is fictional, it does speak of the horrors endured and the eternal hope that can move the spirit forward to conquer. I was just speaking with my husband earlier about Japan. The loss so great it is unimaginable. I don't know what I can do and I want to do...but, it is far more than that, far more. This is utter despair. I felt I need to take this in closely and think so I am coming back to read and post to these last two. It's been a gut-wrenching year, hasn't it? Especially these last weeks. Christ Church, then Japan. Not to mention all the turmoil elsewhere. But the story of LOTR pulls me back, gives me a shake to sort out my priorities and give me back hope. Thanks so much for writing such thoughtful comments, Verangel. I am sure you will appreciate this whole three-part series for this year's anniversary of the destruction of the Ring. SOOOOO very late in getting back to you, Verangel, but thank you for dropping in! Very well said, we need the deeds of Tolkien's heros to inspire us more than ever in these dark times. First of all, dear Mechtild, quite right to praise any and all those who give up inspiration and hope in these days and model for us what Endurance Beyond Hope is like. Praise them indeed! It was not accidental that the first film came out so shortly after Sept. 11. Now onto the poem, wow! Powerful, sad, despairing, my dear jan-u-wine as you delve once more into that tortured soul at the same time Frodo feels Sauron delve in with the worst of the rapes the Ring-bearer has suffered through. Yet this does not show just despair but also the endurance of that dear one's soul, body, heart and will. I hadn't heard of Mount Doom by that name before, but it fits and dare I say the poem ends with not exactly hope, but with the certainty that Sauron will be defeated, even if Frodo is also. Love it! I'm sorry that I've been so late in replying, Antane, and I am glad that you found the effort worthy! Wow. I think Jan's really caught the paradox of the merging between Sauron and Frodo at this moment. It's very powerful and frightening--much more frightening than the moment Tolkien gives us because he's distanced us from Frodo then. I'm thinking this is the moments before Frodo claims the ring and puts it on and there is still a hair breath's space between the two, where he still has his own humility to find it ironic that Sauron is being revealed to the likes of himself. What I'm getting here is that the moment after he puts it on, he and me are merged then into one and Frodo does not exist independent of Sauron once he claims the ring? That is, until Gollum frees him of the burden. Jan? That you must ask jan-u-wine, exactlt which moment this is in the horrible process. Every reader has her own understanding of what went on in there. As you say, Tolkien did not portray the inner workings of the scene -- giving us all something to chew on ever since! And something to write about as fanfic sub-creators. :) It sure is an excellent piece, though, whatever one thinks went on just before the Ring was claimed. Poor, dear Frodo. What a terrible moment. as always, there's a story to this. As I wrote this, I was preparing to read "Mt. Doom" as part of Reading Day LA. I had also listened to that portion of the BBC recording. Movie-verse and book-verse are mixing freely here, I should say, with images from the movie prompting some of the verse. When we see (for example) Frodo 'batting' away imaginary wraiths (whilst still outside the chamber), we understand that he is in his last throes. To me, it is implied that when, in that scene, he sees (and is seen by) The Eye, that there is another blow to his sanity and self-hood struck, a self-hood that must have been on a thread even before that. Frodo, as a person, is dying. Not his body, perhaps, but all that makes him *himself* is shutting down. In the main, I should say that this poem is written to the movie scene where Sam is begging Frodo to throw the Ring in. We hear Frodo's heart-beat, we see the struggle, apparent upon his face. A tear slides down his cheek. And then there is no more heart-beat. Of course, if there is no more Frodo, how is it that he is speaking (in this poem)? It's a cheat of a sort, yes, but the most powerful way that I could think of to tell the story. I could tell it from Sam's pov, but he wouldn't be experiencing what Frodo was. I could tell it from Sauron's pov. For myself, though I have written poems from his pov, I'm not all that interested in them. It is human struggle that concerns me, human morals and redemption. Sadly, I don't think that Sauron put up much of a struggle against his morally objectionable impulses. So, we hear Frodo's voice, here, even though really we should not be able to.